Please call (877) 627-5094 for availability. Order now for shipment as early as Thursday, May 2. This ring is hand-made in our Los Angeles manufacturing facility and currently estimated to ship on Thursday, May 2. Should you need this item before the estimated ship date, please contact our customer support staff at 1-877-627-5094 1-877-627-5094. 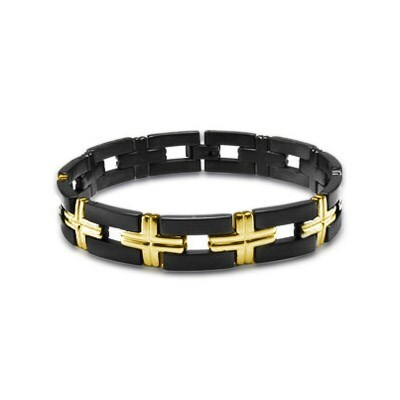 This stunning dual satin and high polish finish men's titanium bracelet has a classic cross design that is extraordinarily striking due to the contrast of the black and gold immerse plating. Measures 8.5" in diameter and is 12mm wide. 30-Day Return Policy: Adiamor believes in complete customer satisfaction. We gladly refund, replace or exchange any unworn item received back in our facility within 30 days. Please call /Contact-Adiamor for availability.